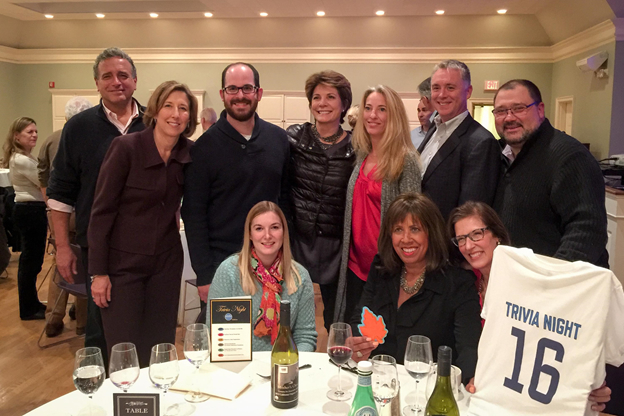 Members of the winning team, “Got Mock,” plus WEF President Alisa Trugerman gathered for a celebratory photo (L to R) Carly Maier, Peggy Jorgensen, Robyn Tas, John Seigenthaler, Alisa Trugerman, Andrew Marone, Kerry Brock, Laura Del Savio, Michael Del Savio, Robert Tas. Photo courtesy of Eileen Sawyer, WEF Board of Directors. Ten teams and 75 players gathered at Norfield Church Parish Hall on November 5th for three rousing rounds of Trivial Pursuit. All proceeds went directly to support the mission* of the Weston Education Foundation (WEF) with a particular focus to fund the school district’s new Maker Space initiative to transform our school libraries into Learning Commons that will serve as creative hubs for students and teachers. “We raised more than $7,000 and everyone had an amazing time. Emcee John Seigenthaler [former news anchor at Al Jazeera America, NBC and MSNBC] kept the evening fast paced and exciting and the food and table service by AMG Catering was lovely,” said WEF President, Alisa Trugerman. “Dr. William McKersie, Superintendent of our Weston Schools, addressed the crowd. Other school and community leaders were also on hand to meet, greet and answer questions,” Trugerman said.